With “Infrastructure Week” May 15-19 and the May 17-18 Transportation Construction Coalition (TCC) Washington Fly-in, industry groups have been working overtime to draw congressional and Trump administration attention to national transportation investment issues. The Partnership for America’s Economic Expressway (AEE) has ratcheted up its D.C.-centric digital advertising and social media campaign to position the National Highway Freight Network as the focal point of any federal infrastructure package that is developed this year. Check out www.economicexpressway.org to learn more about the AEE program. The digital ads are geo-targeting members of Congress and their staffs on their mobile devices and desktop computers. 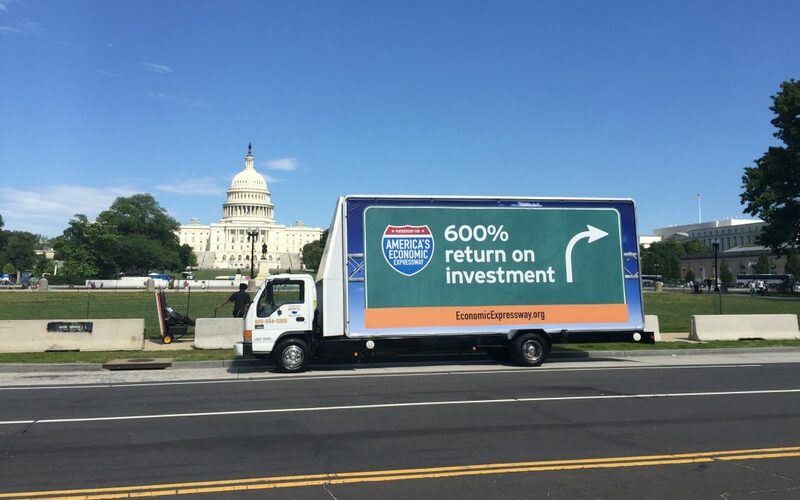 Two AEE mobile advertising billboards are also driving key routes near the U.S. Capitol area—on both the House and Senate side—from 9 a.m.-5 p.m. from May 16 through May 18. The billboard’s primary target audiences are members of Congress and their staffs, especially during their commutes and at lunchtime, and industry executives in Washington participating in all of the week’s activities. The Transportation Construction Coalition (TCC), which is co-chaired by ARTBA and the Associated General Contractors of America, is running a print ad in Politico and The Hill urging Congress to fix the Highway Trust Fund as part of any tax reform package. See the ad.